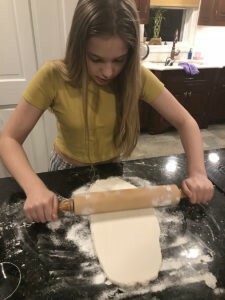 This recipe for gluten-free dumplings may seem like it has a lot of ingredients or is too complicated for kids, but it is actually easy and fun. Just follow the directions step by step, and it will be delicious. For the dough, combine 2 cups flour, water and salt in a large mixing bowl. Stir with a firm rubber spatula or a wooden spoon. When everything is evenly combined, turn the dough out onto a floured countertop. Now, this is where it can get a little messy, but it’s totally worth it for these amazing dumplings! Keep adding flour until the dough is firm but rollable. Roll the dough out until it is about ¼-inch thick, then cut it into circles. I used a cookie cutter about 4 inches in diameter to do this part. 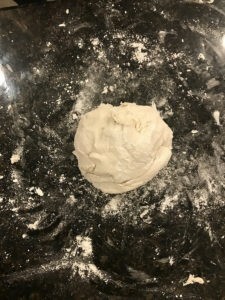 Next, roll out the leftover dough until it is ¼-inch thick, then repeat this process until you have used all the dough. Set rounds aside until it’s time to assemble the dumplings. Now it’s time to make the filling. 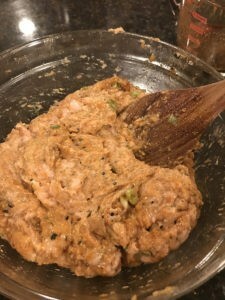 In a small mixing bowl, add soy sauce, scallions, sesame oil, rice wine vinegar, curry paste, lime juice and zest, miso paste, fish sauce, ginger, hot sauce and black sesame seeds. 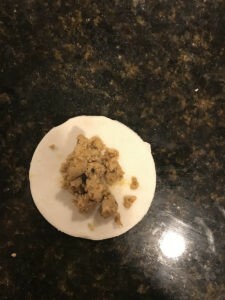 Mix together to form a “marinade” of sorts for the ground chicken. 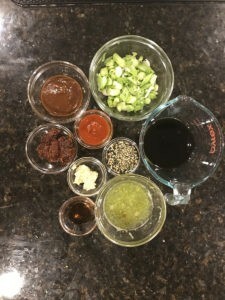 TASTE YOUR MARINADE! This sauce can be tweaked to your personal preference, so change it up if you don’t love the way it tastes. Add about a tablespoon of oil to a large pan over medium heat. 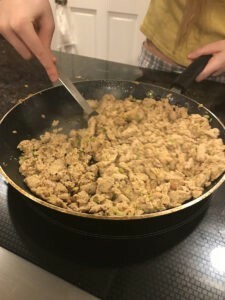 In a large mixing bowl, combine the ground chicken and the marinade. Mix until evenly combined. Add the chicken mixture to the hot pan and break it apart into little chunks with a firm wooden or plastic spatula. Cook, about 5 minutes, making sure the chicken is fully cooked. After the chicken is cooked through, transfer it into a clean bowl and make the dumplings. Assembling the dumplings is the most fun part of this recipe. The whole family can take part because this step doesn’t require any sharp objects or heat. Now it’s time to cook the dumplings. Heat a thin layer of olive oil in a large pan on medium-high heat. Once the oil is heated, GENTLY add a few dumplings to the pan. The dumplings should be more or less shaped like triangular prisms, so you will be browning three sides, starting with the flat bottom. Once it’s nice and golden brown, flip to one of the other sides. These dumplings burn easily, so keep an eye on the pan! When each side is cooked to your liking, take the dumplings out of the pan and transfer to a plate. Let them sit a few minutes so they aren’t too hot, and then enjoy. 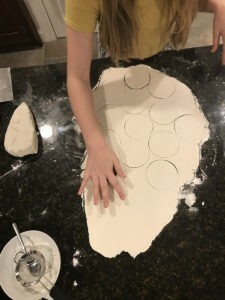 *Use this simple technique to seal the dumpling: First, run your fingers along the curved borders of the semicircle, pinching as you go. 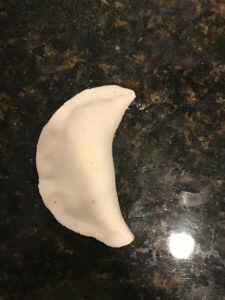 Once the dumpling is sealed, you can either leave it as-is or twist and fold the pinched edge starting at one side and working over to the other. A few things to mind when making these delicious dumplings! Be careful of splattering oil when cooking the filling and pan frying the dumplings. This should always be done by an adult for safety reasons. If you don’t want flour on the countertops when making the dough, put down plastic wrap or a rolling mat. When rolling out the dough, you will need to add lots of extra flour (mine ended up being about a cup extra). Don’t get discouraged if your dough isn’t the perfect texture in 5 minutes—keep working at it. This can also be fun for younger kids because they get to play with the squishy dough. Have fun! 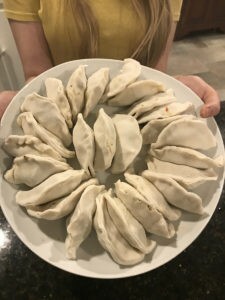 This recipe is so fun to make with the whole family, and lots of people can be working on different components of the dumplings. Get everyone involved. Click here for more recipes kids will love to prepare—and eat!